Landing and Mars will be seen with a naked eye, SW. From sunset, use a tube for better vision. Ooooooh, Marco A and B are also flying past at the same time. X band kit at the ready. You'll need a fair bit of X band kit unless the craft have higher gain antennas than they have been using. For MCOA & B Madrid uses Deep Space Station 63 (DSS-63) Anniversary (70m) and still only gets -155 to-160dBm if they are lucky. They don't get much more than that from InSight on a 35m dish. NSYT is about 20-30dB below my threshold on a 1.2m. I know where some dishes are mothballed that would be perfect for the job. Terryl's pad isn't too far, I'll pick the locks, you can be the driver. Landing today, though there is an eight minute delay from Mars, in order to sweep up the debris. Live veiwing from mission control from early afternoon. It landed safely, but now does it have enough change for the parking meter??? Can it run from the Martian hordes ? Did they pack the right adaptor for the mains plug? Hope the voltage is the same as well! 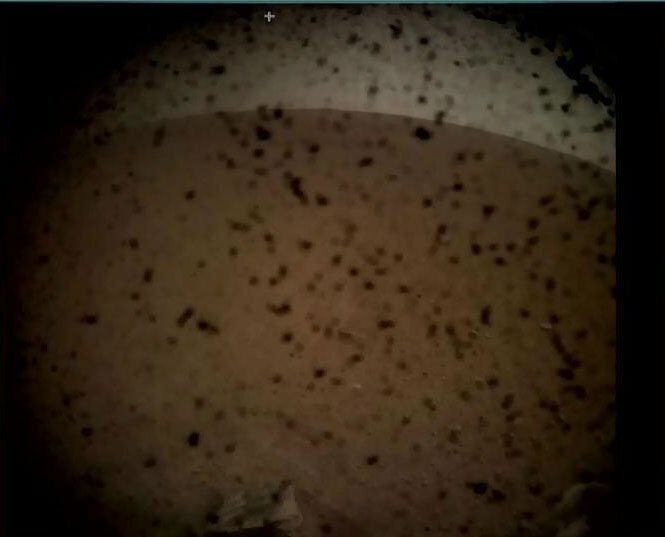 And the first photo from the lander.. Most dissertations that mention this possibility are buried away. Some beads and trinkets were packed aboard just in case.